In this bracelet, I combined two themes, the protective properties of the ancient evil eye protection symbol (believed to ward off evil), and the calming balance of Heaven Eye Agate. 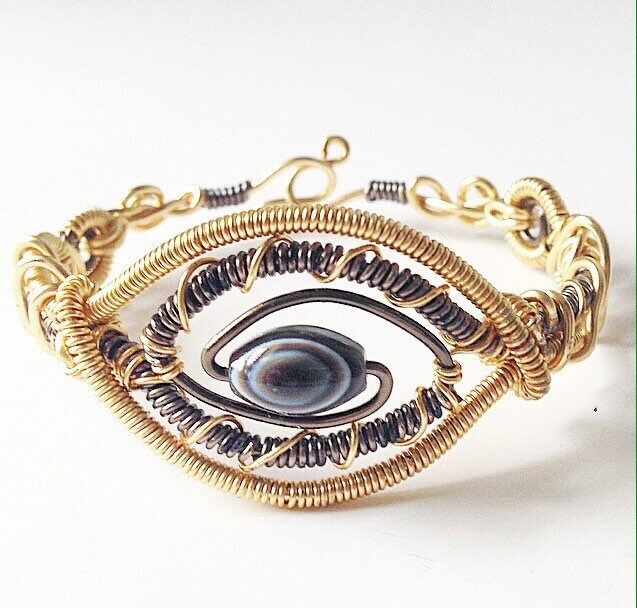 Agate Eyes are used to help find your inner peace, and bring calm back into your life. The framework is gold and gunmetal copper wire, wrapped and woven to accent the stone. The bracelet measures 7.5 inches on the inside, and will comfortably fit wrists up to 7 inches.